Stoat: Fossil fuel industry spent nearly $2 billion to kill U.S. climate action? Fossil fuel industry spent nearly $2 billion to kill U.S. climate action? Via Twatter (and VV! 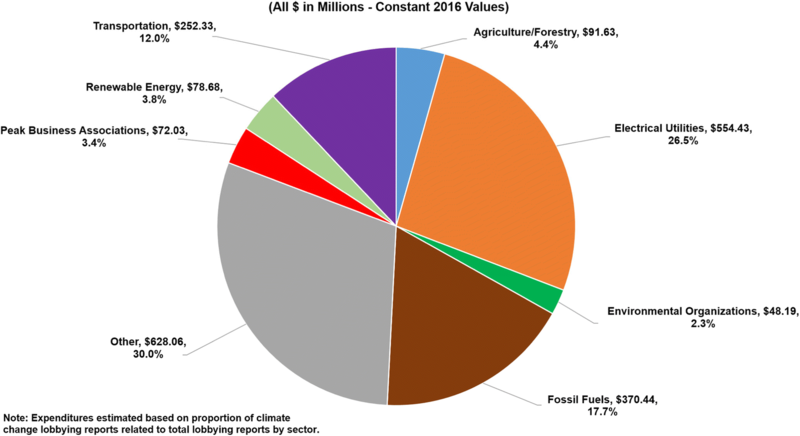 ), I discover that Fossil fuel industry spent nearly $2 billion to kill U.S. climate action, new study finds; and Industry has out-lobbied environmentalists 10-to-1 on climate since 2000. I can't say I'm terribly surprised, though I'm going to quibble the numbers, and I'm not at all sure they mean quite what the breathless think they mean. The study is actually a proper published peer-reviewed thingy by Robert J. Brulle in Climatic Change, and even for a journal devoted to the Description, Causes and Implications of Climatic Change it seems a teensy bit political rather than sciencey to me, but meh. 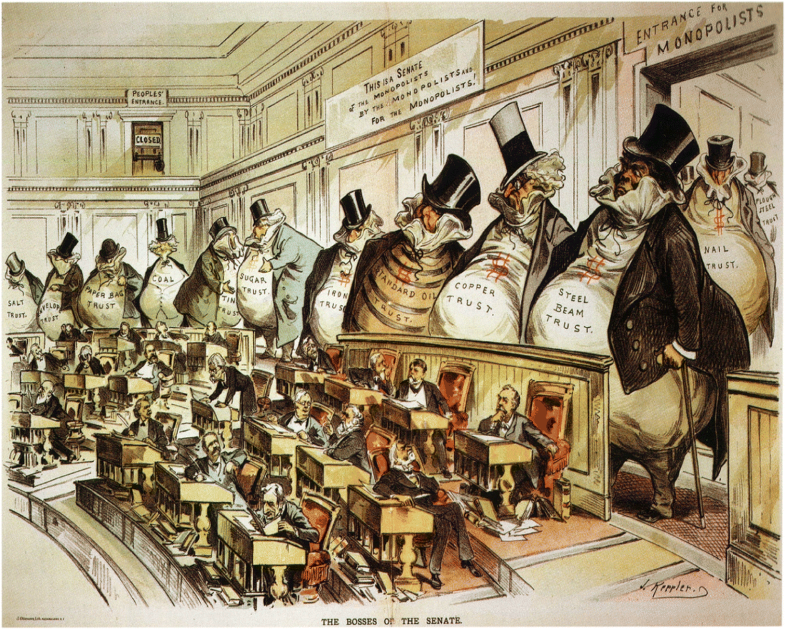 In case you're in any doubt, though, the study includes a cartoon The lithograph “The Bosses of the Senate” by Joseph Keppler to make it's biases clear. Lobbying, though it has a poor reputation, is part of the communication within any governmental system. There are two sorts of lobbying: good lobbying, which is done by people you like for causes you support (after all, as our source tells us, the Evil Fossil Fuel industry has outspent the Nice Environmentalists 10-to-1, but that does imply $200 million spent lobbying by the env folk1, all of it Good) and Bad Lobbying done by people you don't like for causes you oppose. Somewhat more seriously, the Good lobbying should be information feedback into the system, not buying the system. Alas, attempts to allow only Good lobbying are stymied by it being hard to tell from Bad by objective criteria, and by the desire of the political class to permit lots of opportunities for lobbying, for the obvious reasons. The solution, of course, is to have government Do Less, thereby lessening the potential for lobbying. Just accepting the numbers is no fun; you'll expect me to quibble them so I will. The total spend (2000 to 2016) was about $2 billion, which is about 4% of the total. The annual average is about $120 million. Before we go on, allow me to tell you something that won't interest you: During the 2016 election cycle, organised labour spent $217m—88% of it going to Democrats, according to The Economist. Are you outraged by that? Probably not, since it is Good lobbying. The lobbying data seems to have come from Open Secrets, and they make it available per sector. Health is the biggest; there's loadsa dosh in healthcare in the US. Aanyway, what of my quibbles? Well first of all $2 billion is all lobbying, so it includes the Good lobbying by the env folk. Rather more importantly though it includes a pile of other folk too: see the picture I've inlined from the study. So the FF spend is $370 million, the EO is $48 million. And so ThinkProgress's proud headline is a lie. Quite possibly not a deliberate lie; most likely they're just too lazy or too stupid to trouble themselves to read the paper. You'll also notice that the ratio of 370 to 48 is not ten-to-one, that's because the one in 10-to-1 is EO and the renewable sector, and I think they threw some other bits - maybe electrical utilities - into the "fossil" basket (does that mean EU doing solar are counted in the "fossil" basket?). My second quibble is that they identify climate lobbying by keyword search within lobbying records. Each lobbying record is (I presume) likely to have a number of keywords in it, and (or so it seems to me) likely that if you did this analysis across a wide variety of topics, you'd discover that you'd counted more than 100% of the total lobbying expenditure. This is a point that I'd have expected the paper to address; but if it did, I missed it. My main quibble, though, is going to be suggesting that lobbying isn't necessarily the major source of influence. The paper doesn't consider this point; it's only interest is lobbying, nothing else. So if I were to look at my native UK, or indeed anywhere in Europe, I'd discover that "believing in global warming" or however you choose to phrase it is official government policy. I'd probably also discover that FF folk outspend the Env folk, but that both are outspent by Govt propaganda. You'll riposte that isn't true in the good ol' US of A. But would you be right? We're talking 2016 and before, not the Trump era, so that includes 8 years of Obama presidency, which was actually rather GW-friendly, though admittedly not to the extent of managing to do anything useful. 1. Ah, no, it doesn't make $200 million: see the Quibbles section. I was dumb enough to beliave TP's headlines. Never mind, the principle remains. "Before we go on, allow me to tell you something that won't interest you: During the 2016 election cycle, organised labour spent $217m—88% of it going to Democrats, according to The Economist. Are you outraged by that? Probably not, since it is Good lobbying." If that is campaign funding, money going to politicians or helping them getting elected then that is also bad. It does not matter who is bribing politicians with campaign contributions that should always be illegal. It should be one person one vote, not one dollar one vote. >"We're talking 2106 and before"
And so ThinkProgress's proud headline is a lie. Quite possibly not a deliberate lie; most likely they're just too lazy or too stupid to trouble themselves to read the paper." Joe Romm would never lie, at least not like Trump (which isn't saying much as Trump is like a drunkard sailor who has gone AWOL in 1946). ThinkProgress is worse than Breitbart. But then again I would be lying. Par for the course I guess. I haven't been to TP in many a year. But TP must be Good, because, dirty hippies. As for Breitbart, I have heard it through the dirty hippie alternative left wingnut grapevine establishments. But BB must be Bad, because, no dirty hippies. So I can only conspiracy theorize a really ginormous number. Also, If the study only looked at registered lobbyist, that form of lobbying has been on the outs for many years now. Also, that fat catfish (a well know bottom feeder) picture, replace the skinny guys with the fat catfish guys. USAniacistan, more corrupt then the rest of the world combined. In terms of voting, I agree. But voting is not the end of decision making, nor should it be. In terms of decision-making, "resources" should have some influence. "My main quibble, though, is going to be suggesting that lobbying isn't necessarily the major source of influence." We have a unique example playing out here in Alaska, basically Pebble mine is incredibly unpopular with everyone who doesn't stand to make a buck off it i.e. everyone but the shareholders. The guy who donated most to trump in the state was 2nd pick to run the EPA but Pruitt got the job instead, oh he also owns a fishing lodge downstream of Pebble and has long spent money opposing it. The trump admin has ordered USACE to start and finish the EIS (usually it's a rubber stamp at this point) post haste but it won't be ready before November when stand for salmon goes for a vote. Industry is literally outspending the greenies 10 to 1 (even the commercials run by stand for AK are ridiculous) claiming that it will be impossible to permit a culvert. Basically it gives the state power to shut down large projects overriding the feds. I work at a sister regulatory agency to USACE, regular projects like culverts, ditches, grading, etc. are granted what are known as categorical exclusions (catex) which means they fall under a general permit (deepwater horizon was a catex but that's a whole other story). If you read stand for salmon 16.05.875 (c) the terms "significant adverse effects" gives the state has the same power as feds do to approve a project. I'm interested in how the vote shakes out in November, will be a real test of how effective industry propaganda is. *The same power to issue catex's like the Feds do if that wasn't clear. Our representatives in government are supposed to work for us. Lobbying for things that go against the electorate's interests is Bad lobbying. Lobbying for things that are in the electorate's interests is Good lobbying. So lobbying to keep the planet from environmental collapse is Good lobbying. Lobbying for ecocide is Bad lobbying. Models don't reproduce the warm Arctic of the Pliocene. What will happen in the Arctic as the climate continues to warm? Sure. But while it's a nice phrase, it doesn't correspond to an objective test. Like beauty, which you will see but I might not, you'll know it when you see it, but you couldn't put an objective description down. Without that, the law cannot act. Victor, it may be a pure ideal that political campaigns should have no funding, but don't think that's ever been practical. Thus people supporting a campaign provide funds for research and materials to get the message to the voting public. Of course a lot of funding is in kind, as when media support a campaign rather than leaving it to the campaign to advertise their own position, thus giving influence to whoever owns the media. Not a new issue. To counter the ability to buy influence, there have been restrictions on campaign spending, but the scale of recent spending has been enormous. New technology introducing new corruption. Citizens United has overcome one set of restrictions, and the Brexit campaign has seen flouting of the rules with no more remedy than a trivial fine – so far. The police may take action, but too late for that voting result. One point that's easier to remedy, greengrocers' apostrophe in para 2. It's not right!